October 15, 2012, 5:30 P.M.
4. Roll Call: (Absent: Weaver & Shafer) / (Present: SInk, York, Francis) ... with vice-Mayor Bud York presiding. A. Approval of October # 1 Payroll in the amount of $42,219.88. B. Approval of Claims in the amount of $60,060.92. C. Approval of Minutes from October 1, 2012 Regular Meeting and October 3, 2012 Special Meeting. D. Approval to close Main Street from 9th to 14th Streets from 11:00 p.m. to 12:00 p.m. November 12, 2012 for the Annual Veterans Day Parade. 7. Quarterly report from Collinsville Park Board. -- Ted Wright reported on the two major park improvements about to happen: 1) the trail project (see item 9 below) for bid approval. 2) The Land & Water grant approval for a new pavilion, parking and landscaping, etc. Also the new equipment at Charlie's Park and a change in plans on the extra play equipment which may now be used somewhere at city park rather than be sold. The old city ordinances relating the the park board have been reviewed and a draft of those proposed changes is pending. Splash pad closed Oct. 1st for winter. Other pending items: sand volleyball, security lights and cameras, pond, community center, shade features, splash pad water reuse, softball/tennis fence repairs, foot bridge replacement, sidewalks and trails to the park from other city locations. The recalled "glider" / "slide" at city park is still awaiting replacement by the manufacturer ... since May. 8. Report from Collinsville Downtown Inc. -- Mary Risley reported on successful "Taste of Collinsville" and upcoming "Just Treats" events. The Halloween parade will start at 5:30pm (from the plaza at 12th & Main) headed to the Veterans Building (9th & Main). The kids will then stop by merchants for candy and make their way back to the plaza where the costume judgng starts at 7pm (after free hot dogs and hot coco). 9. Discussion and possible action to accept bid from Mac Construction, Inc. in the amount of $237,111 on Collinsville Park Trail Project. -- Approved . Two valid bids were received and the architect (LandPlan) recommended the low bid which was accepted. The trails project had been bid before but all bids were rejected then (as too high) previously. See Additional info (below right). 10. Discussion and possible action to purchase 2012 Ford F350 Flat Bed Truck for Cemetery/Park Department from Jack Kissee Ford in the amount of $29,863. -- Approved, a budgeted item as the current aging vehicles for the park / cemetery are being selectively upgraded. 11. Discussion and possible action concerning contract with Stan Sallee regarding Economic Development. -- Approved. Apparently a 6 month contract similar to the previous "Retail Attractions"contract but with exclusivity (to Collinsville) and performance incentives ($5K for 50,000sqft of new sales tax producing retail/commercial) added per commission request. * The new city hall phone system has been installed and trainng was to begin Tuesday Oct. 16th. The old phones are still in place also until a switchover occurs. * The new Hazard Mitigation Planning group met for the first time Oct. 10th. Expect to meet ~monthly to revise the previous (5 year old) plan. * Polk & Sallee met with Tulsa Chamber folks recently. They said they were excited to work with Stan Sallee in his new economic development role. A. Approval of October # 1 Payroll in the amount of $28,109.00. B. Approval of Claims in the amount of $336,778.18. C. Approval of Minutes October 1, 2012 Regular Meeting. * lots of local rain Fri (Oct. 12) and Sat (Oct. 13). Six inches was measured in a rain guage at the water plant. City staff was out checking for draining issues to report to the group doing the draining study. * The city has won a "2011 Water Floridaztion" Award for meeting all the standards with their regular reports. * The city electrical department now has an apprentice program approved (by the Department of Labor). 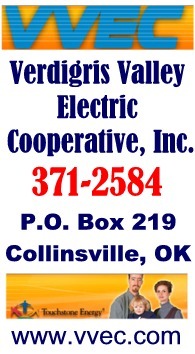 The current city electrical staff is small but experienced. This will allow that experience to be passed on for the future and will include computer based tesing and hands on experience. The program also includes periodic step raises as incentive for those trained here to stay. 6. New Business (business which was not foreseen prior to the posting of this agenda.) -- Stan Sallee requested a city work session to provide further direction on what the commission would like to occur for economic development. 8. Discussion and possible action to reject all bids for Collinsville Park Trail project and re-bid the project. -- Approved (the reject and rebid to start). All the bids received were over the estimated cost set by project architects (Landplan). The closest was ~$78K. City Manager Pam Polk indicated the project would be rebid with new wording to allow CDBG grant money (~$69k) to be used to help meet the increased costs. 9. 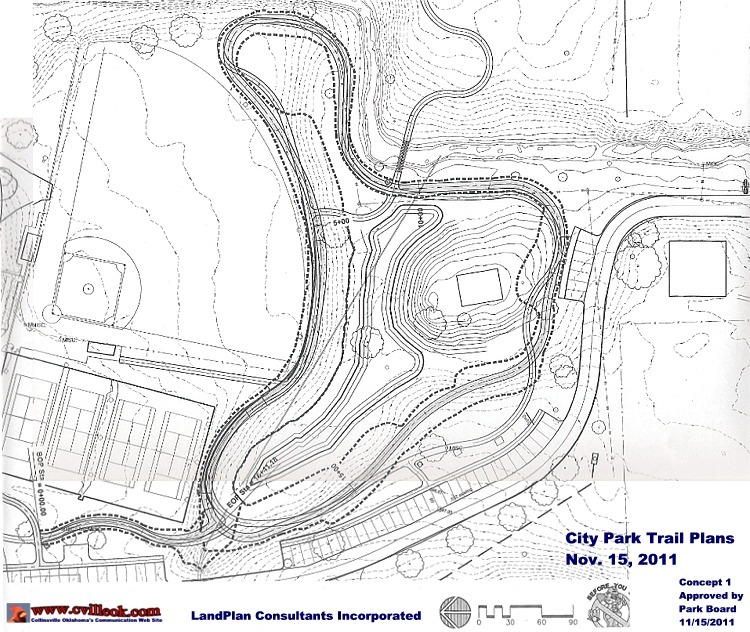 Discussion and possible action for approval of Collinsville Park Trail site plan design. -- Approved, design option 1 (as recommended by the Park board). No new lighting or benches, etc are included in the existing trails grant but might be requested in a future grant application. 4. Presentation from LandPlan regarding two (2) Trail Grant Concepts. -- Barbara Tartar presented the two trail plan choices with option 1 being 1641 feet in length but not requiring a retaining wall on the south end to salvage furture parking spots. The design would allow a slightly smaller pond later. The 2nd design option (1661 feet long) allowed a slightly larger pond but impacted future parking without adding a retaining wall. 5. Discussion and possible action to approve Trail Grant design. -- Design option 1 was selected and approved for recommendation to the City Commission. 4. Discussion and possible action to contract with LandPlan Consultants for Trails Grant services. -- Approved, the park board recommends to the commission for final consideration. LandPlan has been the park architect on previous projects and prepared the Oklahoma Recreational Trails grant application resulting in the funds for an 80/20% split ($160,000 grant + $49,523 city match) with Landplan's fees totaling $47,597 included within those amounts. [Note this is grant is only for an 8 foot wide concrete trail in the east side of the park. There is another grant application still pending for several other park improvements including new shelters and parking. 7. Discussion and possible approval of Recreation Trails grant application areas to include trail around proposed pond/wetland area. -- Approved, an 8-foot cement trail around a potential pond on the east side of the park will be presented in a grant application being prepared by LandPlan Consultants which is due before the end of Jan.2011. Will next be considered by the city commission for the city's 20% match for an 80% grant. This version of the plan drops a bridge over the creek and possible connection to another path to keep costs within original estimates.